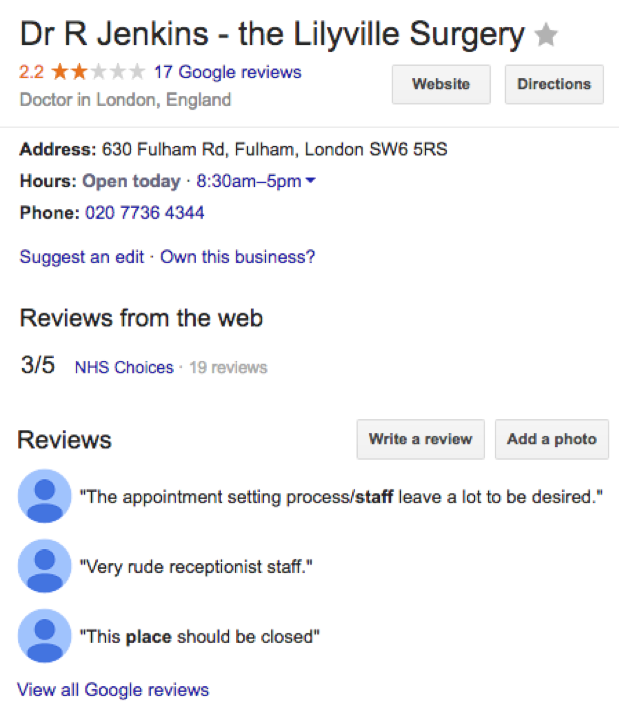 HelpHound Blog: Doctors - what happens if you ignore Google reviews? Doctors - what happens if you ignore Google reviews? ...maybe not straight away, but over time. It is simple really, and its all down to a combination of human motivation and how we interact with the web. People are just more motivated to write negative reviews, often in the heat of the moment, and often putting the blame on the wrong agency. 1. Logical: these are just 17 opinions out of many thousands, of course some people are going to be unhappy/disappointed but this should not colour a prospective - or existing - patient's view of the surgery (remember that most existing patients will see your reviews simply by the accident of them being in their eye-line when they look up your phone number/address/website). 2. 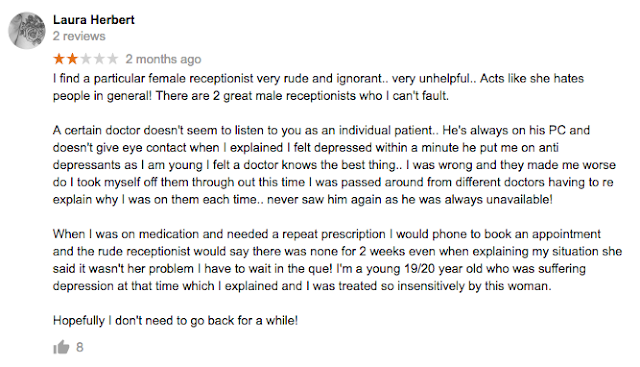 Emotional: "How can I possibly entrust my health and welfare to a surgery that scores so low (and/or has so many negative reviews)?" Everyone reads reviews nowadays, and their reaction is likely to be a combination of both. 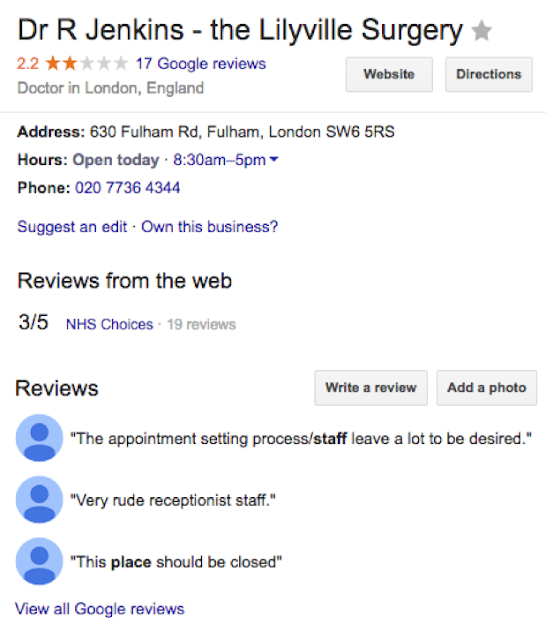 No-one has to actively search for Google reviews, they are displayed in every search. In addition, many more reviews are being written - fourteen of the seventeen reviews of the surgery above have been written in the last twelve months. That pattern is not going to reverse itself any time soon. Surgeries must engage - with Google. That does not mean abandoning any current patient feedback mechanisms, far from it, but it does mean incorporating modern professional review management into their interaction with patients. Otherwise: dissatisfied patients will continue to post to Google, just in increasing numbers (as more and more people find they are able to write a Google review). By sending an email or text to the patient asking them for a review to be independently verified and moderated by HelpHound potentially misleading or inaccurate reviews will be sent to the surgery so they can engage with the patient pre-publication, reviews will then be displayed on the surgery's own website and the reviewer then invited to copy their review to Google. We are here to provide you with professional advice, and to design a review management strategy that dovetails with the way you operate your particular surgery, not shoehorn you into some 'off the peg' reviews solution.